The road trip started on Wednesday March 11 in Toronto–a homecoming of sorts for many players. The Phantoms secured a 4-3 road WIN behind Nick Cousins’ second hat-trick of the season, which included a penalty shot goal. On Friday the 13th over in Providence, the Phantoms WON in a shoot-out, 2-1 (1-0). Scotty Laughton had the game-winner in the third round of the shootout, as the P-Bruins player then hit the post on the tie-try. The Phantoms stayed in (the woods of) Rhode Island for another game Saturday 3/14 versus Bridgeport. They trailed 2-0 through much of the game before roaring back to a 4-2 VICTORY by adding an empty netter at the end. Cousins and Comrie combined to tie the game. Akeson had the game-winner, and Lauridsen had the EN. Nick Cousins received his first call to the NHL following the game–more below. Friday night in Hartford, the “new-look” Phantoms took a 3-2 LOSS to the WolfPack. Rookie Cole Bardreau got a goal in his first professional game, centering the fourth line. Blair Jones, returning to the lineup for the first time since January’s groin injury, had the other goal. Zeppy was in goal using one of his four sticks. Last night in Worcester our Phantoms took it pretty hard. It was a 6-1 LOSS when the final horn sounded. Brandon Manning notched our only tally–and then only when it was 5-0 at the time. Rookie netminder Anthonly Stolarz played the whole game; reports out of Worcester suggested that his play was not at fault; he was left out to dry by his team, on most occasions. Standings: After securing 6 of a possible 10 standings points on the road trip, the Phantoms return home sitting in 12th place, 10 points behind the final playoff position, with up to 3 games in hand. It’s a very similar position to where they were when they left. It might be winning hockey–3 out of 5–but it’s not enough to make up ground in the standings. We’re not eliminated yet, but the nails keep getting pounded into the coffin with each loss. Power Play: The Phantoms return sporting the 18th rated Power Play unit–out of 30–and the 19th rated Penalty Kill. Our opponent in tonight’s game, the WB-S Pens, are 12th on the Power Play and 21st on the Penalty Kill. Attendance: The Phantoms remain in 4th place in the attendance standings, averaging 8,103 per game. That average should only go up with today’s game. As you’ve probably heard, Kram-favorite and leading scorer Nick Cousins was named AHL/CCM Player of the Week last week, and got his first call to the NHL. I’ve heard good things about his play with the big boys–he may not be back right away. As you saw from the scoring report above, Blair Jones has returned to the lineup. We welcome him back with the Cousins call-up! Brandon Manning had been with the Flyers for a time, but spend most of it as a healthy scratch. He’s back, and holding down his usual spot in the top pair and on the 1st Power Play unit. Cole “Barsy” Bardreau, a gritty center-man who was named the top “defensive forward” in his college league, has joined the Phantoms on an ATO (Amateur Try Out) contract. He is signed as a pro for the next two seasons. Petr Straka has returned to the lineup after missing several games with a hand/wrist injury he suffered in the last home stand. He was hit by a slap shot and had to leave a game. With all the player movement, Jesper Pettersson was a recent scratch, Lamarche was returned to Reading, and Goumas and Mathers have been healthy scratches. With last night’s loss, it’s possible Coach Murray will insert a scratched guy or two to try to add a spark. Plus, with the third game in two and a half days, perhaps some guys could use a rest. For Good Times, Bad Times, it should be Zepp in goal tonight. I heard Mason was a surprise scratch last night in Edmonton, but the Flyers don’t play again until Wednesday, home for the Blackhawks. The Baby Pens are back, as they wrap up their own “three-in-three” having lost in overtime to Syracuse Friday night, and lost again at home against Binghamton last night. But, they’ve got a shorter bus ride than we do today. This is the first of a bunch of games versus Wilkes-Barre/Scranton down the stretch. Game Time: 5:05PM PUCK DROP. This is our first Sunday-PM game; note the new start time. Doors Open: 4:00PM. Given the basketball on TV and all, I’m going to recommend you get downtown by 2PM to secure a seat for a pre-game meal at Chickie’s and Pete’s. Traffic and Parking: Hamilton Street will have a lane-restriction between 9th and 10th streets until 2:30PM today. If you’re coming downtown from the West, consider flipping down to Walnut Street to avoid that block before 2:30PM–or if they don’t get it cleaned up in time. Remember that the Arena North garage (Linden St) is pre-paid only at this time. As of this writing, parking is still available for today’s game. Click here to attempt to purchase. Keep in mind it will be $9.50 with the fees, compared with $6 at most other Parking Authority facilities, and $3 at the Government Deck. Tickets: Tickets are limited as this game has gone “SRO.” Remember, they don’t start selling those “SRO” tickets until the seats are almost all sold out. The VIP seats are sold out. I recommend securing a ticket online before coming downtown, just to be safe. Jersey Auction: The jersey pictured at the top of the page will be worn during the game and auctioned off afterwards. Bring your good checkbook, as prices have been high in the past. At the last auction (Inaugural Season Jersey, admittedly) prices ranged from $650 (meLVin) to >$2,000.00 (Stortini, Cousins). 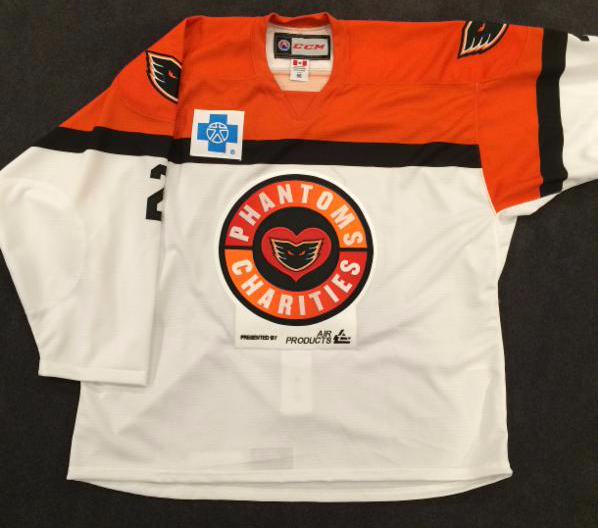 It’s worth noting that this auction will be for the benefit of Phantoms Charities, while the past two were for benefit of “general fund” (read: “profit”). The auction will be conducted in the club sections, by an auctioneer, following the game. Watch for number 9. That’s Cole Bardreau. I think we’re gonna love him. Watch to see who gets skates tonight. Murray may scratch guys he thought didn’t play well last night or guys who need a break following the last two games and the overnight travel. Watch your email for tickets to the Phantoms Carnival on Friday. Season Ticket Holders should receive them by email tomorrow. Watch the Pens’ goaltenders–both are outstanding usually. Zatkoff was in net last night, so I assume we’ll see the rookie Murray today. He’s the guy who set the record for most scoreless minutes in a row, ever, in the AHL. Good times, for our struggling attack. Watch to see if the jersey auction prices continue to soar. This design is a little less fancy than the last one, and less unique given the inaugural nature of the previous. I predict a slight decrease from last time, but still very high pricing. But then, there’s this. This is the first of four straight home games over the next eight days at the PPL Center. The Syracuse Crunch will be in town for a mid-week tilt on Wednesday night with $2 Coors Light happy hour. Please note: I have a very limited number of extra tickets for Wednesday’s game for only $11.50. Let me know if you’re interested (KramOf209(at)gmail.com). The Penguins will return to “The Electric Vault” on Saturday, then another Sunday afternoon game as first-place Manchester comes to town. Next Sunday’s game features another “Post-game skate with the players” and a 3:05 puck drop.